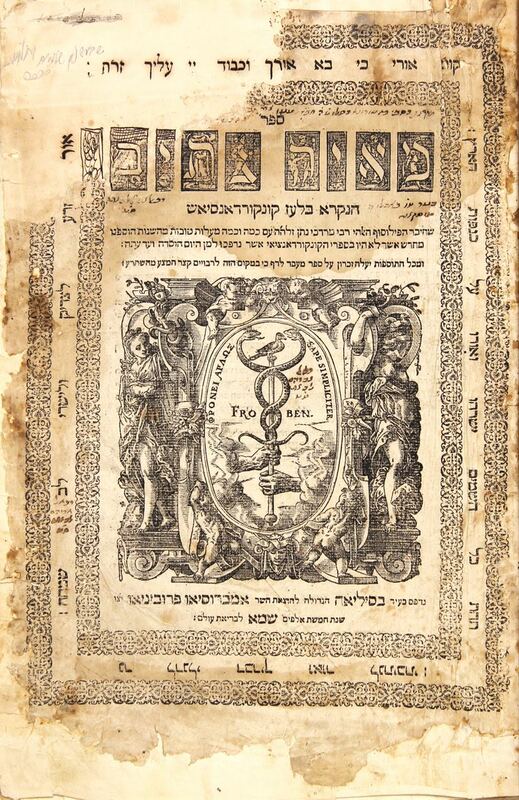 Concordensia of the Bible, organized alphabetically, with roots of words and their sources in the Tanach. By Rabbi and philosopher Mordechai Natan (the Rofeh) and Rabbi Yitzhak ben Kalonymus Natan. Corrected, pretty edition. Printed by Provinio Ambrossio. Cover page has a large illustration of the symbol of the printers. | Rabbi Yitzhak ben Kalonymus Natan, a sage of Spain before the Expulsion, and a Rabbi in Venice. Authored also Mivtzar Yitzhak and Tochachat Metunah—against the converted Geronimo (di Rossi). | Thick, quality pages. Cover page and first pages repaired. Wonderful leather spine. |  pages. 37cm. Generally good condition.